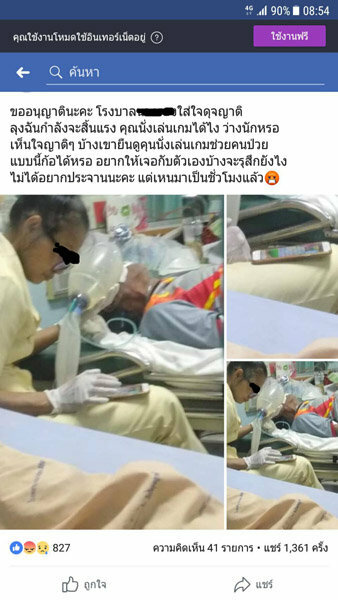 Thai social media went into a frenzy after a nurse's assistant was seen playing games on her phone while operating a respirator for a seriously ill patient. 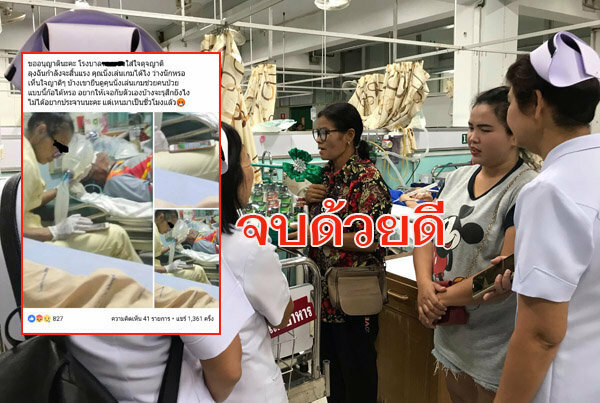 Netizens said it was highly inappropriate for a nurse to have a phone on in such a situation - the man was in a coma. The Buriram hospital apologized and sent the family a basket of fruit and flowers. A doctor spoke of the modern addiction of people to their phones and social media especially at work. A top lawyer said the assistant could have been jailed for ten years if the man died. But the family have removed the clip, accepted the hospital apology and said sorry themselves. Social media went into meltdown after the clip was posted on Facebook by a relative of her uncle in a coma with the nurse's assistant said to be playing games and indifferent to his fate. Dr Noppadon Phitsanuwong said the hospital had acted fact to address the situation. They did this by sending a decorative basket of fruit and goodies to the family and set up a committee to investigate. He agreed that this was not appropriate behavior and the assistant would be subject to the investigation. Manager quoted top online lawyer Ratchaphon Sirisakhon - well known for his comments about everything related to the law after he said it was illegal to comment negatively about a Thai woman's breast size. Ratchaphon also agreed the assistant's actions were inappropriate and added that if the man had died and a negligence charge was made to stick the assistant could go to jail for 10 years and be fined 200,000 baht. Doctor of mental health Dr Yothin Wichetwichai told Manager that many people these days showed they were addicted to their phones and social media. This was a clear case and evidence that many people play games and surf the net at work. He warned people not to spend more than six hours a day online. And young children should be kept off phones completely. The family said that it was not their intention to shame the hospital or cause them to lose face - they were concerned with the fate of their relative. They apologized for the post and took it down. Manager said in their story that it had ended well. what more could you ask for? problem solved. Sadly, addiction to online games and LINE is growing rapidly everywhere, and Thailand is no exception. Netizens were rightly up in arms over this, but think how much worse it would have been if the guy had died due to the nurse being distracted. This should be treated as a lucky near miss. For workplaces, especially those where absolute attention to the task at hand is concerned, management really needs to draw a line in the sand and stop its use completely. Same goes for the roads, where you see people on the phone continuously, without a thought for the danger they are creating for themselves and others. Fruit and flowers, makes everything go away! young children should be kept off phones completely. Why are people getting upset about this incident? After all the hospital said sorry, and sent fruit and flowers. That is just a joke, ban staff carrying mobiles while on duty, easy, ohh cannot do that staff will get upset. i worked as a nurse for 11 years. my ward manager said we could carry phones but only answer emergency calls. which was quite right. How true. It IS an obsession. A completely different, not even dangerous situation: Yesterday a woman in Big C walked into me as she was 'playing' on her phone, looking down at it while oblivious where she was walking. She didn't even say sorry. She probably expected you to say sorry. I have had the same thing happen to me several times and get some nasty looks sometimes. I mean how dare I get in the way of someone not looking where they are going? Yes. It is an obsession. I went to a watch repair shop the other day and the girl working there was crouched down behind the counter having a video phone call with her boyfriend. I decided to wait and see how long before she looked up. 12 minutes! In certain jobs (such as hospitals or any customer service) phones should only be used in emergencies. I often get moaned at for not answering my phone or replying to Line messages within a short time, but I simply don't let my mobile rule my life). Assuming that you're a farang, if you hadn't been in her country, she wouldn't have bumped into you, no? I think it's you that should be apologizing fro cluttering up Big C.
Not really! No chicken essence is a serious oversight. What has been overlooked in this situation is that no nurse or doctor should be handling a phone (the most infectious item a person can carry) in an Intensive Care Unit (ICU) where you are around ill patients whose resistance to infection is very low. Seems like phone addiction is more dangerous than vaping........and it is.